PRESIDENT OF THE UNION JUSTIN ETZINE PRESENTS the room changes to the Executive Board. 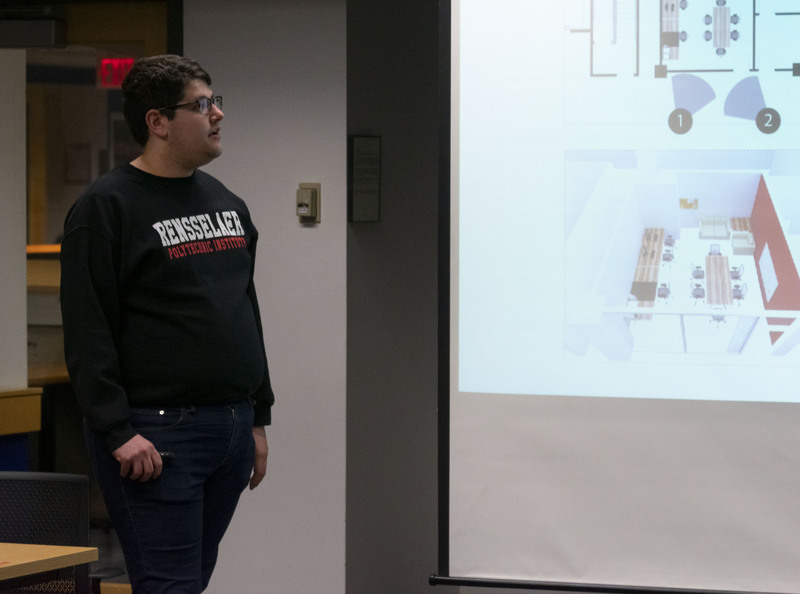 On March 14, during the second-to-last Executive Board meeting of the year, President of the Union Justin Etzine revealed a plan to maximize utilization of the Rensselaer Union real estate. This plan involves shuffling many offices and club spaces around, as well as renovating public spaces. The biggest change is the addition of Union rooms 3806 and 3802 to expand the Clubhouse Pub. This motion also includes the allocation of money from the Facilities Reserves or the facilities operating budget to cover the renovations, which include tearing down the walls connecting Union rooms 3806 and 3802 to the Pub, and the addition of a second exit. This raises the square footage by 268 and the maximum occupancy by 18. The bar will be relocated, allowing space for additional couches, tables, and barstools. The revoked Statler & Waldorf office in Union room 3332 will be given to the Union Show Techs, which previously occupied in the same office as UPAC. The Union Show Techs, previously known as UPAC Light and Sound, have split from UPAC and merged to form a new organization. UPAC will be removed from Union room 3802 and given rooms 3410 and 3411, which currently house the dark room for the Photography Club. The current plan is to open up that room to the third floor by adding windows to the front of the space. The Photography Club will move into Union room 1412, which is located near the entrance to the door of Father’s Marketplace. The space is currently occupied by System Administrators, which will move into a dedicated space inside the Union Administration Office. The Campus Unisex Barbershop is being downsized and move into Ben & Jerry’s current spot. This means that they will downgrade from a four-seat setup to a two-seat. The old space, Union room 1802, will be converted into the new Patroon Room, while Multicultural Affairs acquire its old space. In the proposal, there was mention of a possible LGBTQ+ lounge being put into the newly-acquired room. Ben & Jerry’s will relocate to Union room 1812, RPI TV’s current office. This will allow them to be central to Rathskellar, along the North walkway, which has more foot traffic. RPI TV will move upstairs to Union room 3428, which is currently occupied by The Polytechnic. The Poly will be moving into Union room 3510 and 3511, which are currently public meeting spaces. A motion was later passed to “approve an allocation of up to $15,000 from either FY20 Facilities Reserves or FY20 Facilities” for furniture for this new office space. The current main office will be converted to another meeting room.